Country roots singer Corb Lund, as photographed by Alexandra Valenti in Austin, Texas in 2014. Corb Lund grew up in Southern Alberta living on his family's farm and ranches near Taber, Cardston and Rosemary. He is known for his Albertan Pride. Lund left his hometown of Taber and moved to Edmonton, where he enrolled in the Grant MacEwan College to study jazz guitar and bass. Lund was a founding member of The Smalls. The band retired in the fall of 2001, but reunited in 2014 for a string of shows, the so-called "Slight Return" tour. 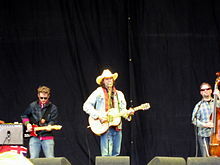 Lund formed his country trio, the Corb Lund Band in 1995. The band changed its name to "Corb Lund and the Hurtin' Albertans" shortly after guitarist Grant Siemens joined the group, and has been touring and recording under that title ever since. Lund currently lives in Lethbridge, Alberta, and spends much of his downtime at his family ranch south of Cardston, Alberta. Corb Lund and the Hurtin' Albertans are a Canadian country music band, formerly known as the Corb Lund Band. The Hurtin' Albertans is Lund's touring band. They have released seven albums to critical acclaim. The band tours regularly in Canada, the United States and Australia. Much of their time is spent in the Canadian Prairies and the American southwest. Siemens is the only member who is not Albertan, hailing from Winnipeg, Manitoba. Farmer/drummer Valgardson and Lund are from Taber, Alberta. The band has toured Europe, where they played the UK Glastonbury Festival, and Australia several times. The group was featured the movie "Slither" (2006) and were part of the soundtrack to the 2008 documentary, "Holler Back: (Not) Voting in an American Town." They have also provided accompaniment for an NBC special in 2006, on which former world figure skating champion and fellow Albertan, Kurt Browning, performed a routine to “Expectation and the Blues”. Their music can also be heard in the ski film "Nine Winters Old." Lund signed a two-album deal with New West Records (home of Dwight Yoakam, Steve Earle, Kris Kristofferson and other major artists) in 2009. His first record on New West, Losin' Lately Gambler, was released in September 2009. Corb Lund and the Hurtin Albertans played their 2009 single "Long Gone to Saskatchewan" in Ottawa for the 2011 Canada Day ceremonies in the presence of the newlywed Duke and Duchess of Cambridge on their Royal visit to Canada. Corb Lund and the Hurtin Albertans released their seventh studio album, Cabin Fever, on August 14, 2012. It debuted at number 1 on the Billboard Canadian Albums Chart. In June 2013, the album was longlisted for the 2013 Polaris Music Prize. Corb Lund released Things That Can't Be Undone in 2015. Lund worked with producer Dave Cobb (Sturgill Simpson, Chris Stapleton, Jason Isbell) to explore new styles and sounds on the album, saying one of the goals of the album was to "get out of my comfort zone." Various Artists - Slither: Music from the Motion Picture, “(Gonna) Shine Up My Boots”, Bulletproof Recording Company Inc. In March 2008, the United Nations Children's Fund announced that the band had donated the use of the song "Horse Soldier, Horse Soldier" as the theme song of UNICEF Team Canada, the Canadian national equestrian skill-at-arms team, to support the team's work with UNICEF to provide food and medical care to AIDS orphans and infants infected with HIV in the third world. In March 2010, Lund appeared as part of Young Artists for Haiti to record a benefit version of K'naan's song "Wavin' Flag". On July 11, 2010, Lund headlined the Medicine Hat Flood Relief Show, which raised $68,000 for Canadian Red Cross 2010 Flood Relief campaign, which benefits those affected by the disastrous flooding in Southern Alberta. Lund has supported the Centre for Family Literacy in Edmonton, Alberta since 2010. Lund co-hosted and headlined the "Fire Aid" benefit concert supporting victims of the Fort McMurray wildfire at Edmonton's Commonwealth Stadium in 2016. ^ Newton, Steve. (2008-02-13) Albertan Corb Lund has provincial pride | Georgia Straight. Straight.com. Retrieved on 2013-03-17. ^ MACPHERS, ALEX J (10 October 2014). "After 13 years, Edmonton's the smalls return to the stage with their innovative fusion of punk, rock, and metal". The Verb. Retrieved 10 October 2014. ^ McCoy, Heath (30 June 2011). "Alberta's Corb Lund ready to share his country with royal couple". Calgary Herald. Retrieved 19 July 2011. ^ from an interview on Americana Music Show #274, published November 24, 2015. "Corb Lund Album & Song Chart History – Canadian Albums". Billboard. Prometheus Global Media. Retrieved August 23, 2012. "Canadian Albums Week of December 1, 2007". Billboard. Prometheus Global Media. Retrieved August 23, 2012. "Canadian Albums Week of October 10, 2009". Billboard. Prometheus Global Media. Retrieved August 19, 2011. ^ "Corb Lund Album & Song Chart History – Country Albums". Billboard. Prometheus Global Media. Retrieved August 23, 2012. ^ "Corb Lund Album & Song Chart History – Heatseekers Albums". Billboard. Prometheus Global Media. Retrieved August 23, 2012. ^ "Canadian album certifications – Corb Lund – Five Dollar Bill". Music Canada. ^ "Canadian album certifications – Corb Lund – Hair in My Eyes Like a Highland Steer". Music Canada. ^ "Canadian album certifications – Corb Lund – Horse Soldier, Horse Soldier". Music Canada. ^ Tinson, Kayla (May 14, 2014). "Corb Lund announces new album "Counterfeit Blues"". Top Country. Retrieved May 29, 2014. ^ "CMT: Videos : Corb Lund : Bible on the Dash". Country Music Television. Retrieved November 10, 2013. ^ "CMT: Videos : Corb Lund : Just Me And These Ponies (For Christmas This Year)". Country Music Television. Retrieved December 17, 2014. ^ "CMT: Videos : Corb Lund : Run This Town". Country Music Television. Retrieved November 18, 2015. ^ "CMT: Videos : Corb Lund : Washed-Up Rock Star Factory Blues". Country Music Television. Retrieved July 27, 2016.